It is a fact widely known that the University of Delhi (DU) takes its co-curricular activities in all gravity, and rehearses the art-forms day in and day out. One of them is the dramatics society, adoringly referred to as the DramSoc. The experience of viewing a play or a nukkad natak performed by the DU’s DramaSocs is similar to being in the midst of earth-shakers, both in its literal and metaphorical sense. A certain madness is transferred from the actors and inevitably catches hold of the audiences, and it might just be one of those times when people actually want to care about social issues. To those involved making a theatre production, a play is so much more than winning a tournament, it is about being the omens of change in the society. In fact, there have been numerous instances where these DramSocs have collaborated with various government and non-government organisations to promote social movements. Delhi University’s dramatics societies have witnessed big names like Amitabh Bachchan, Manoj Bajpayee, Shahrukh Khan, Satish Kaushik and Imtiyaz Ali throughout the years. Out of them is filmmaker Imtiyaz Ali, who in his student years in Hindu college founded the society in 1991 and named it Ibtida (Urdu word for a beginning). Members of the Ibtida organise an annual fest by the name of Medina, which is followed by a alumni meet. Members of the Hindu DramaSoc have a feeling of awe and amazement upon meeting the ex-members, and their emotions are mixed with a certain sense of responsibility because they have big shoes to fill and a legacy to live up to, considering that some of the members are now full-time actors in Mumbai. “We feel like little children in front of them, but they inspire us in ways we can never thank them enough for,” the society members say. There is a lot of time and effort that goes into making a play, and students and professors alike share this joke about how the people in the DramSoc are never seen in class, except for when assignments are due or when there is an internal exam.“Since my practices started, I had to compromise on a few things like watching movies, being able to read the newspaper, and say, hanging out with friends,” says Deepen Gondolay, a second-year student of B. Com and the member of Verbum, the English dramatics society of Sri Venkateshwara College. “But it is not as bad as it sounds if I push everything to the later hours of the evening, I am sorted. I also have to look for tuitions after 7 p.m. every day so I don’t miss practice,” he added. The team becomes like an extended family, and members of Ibtida say that they have explored Delhi and surrounding areas, thanks to the society and its regular oddly-placed tournaments. 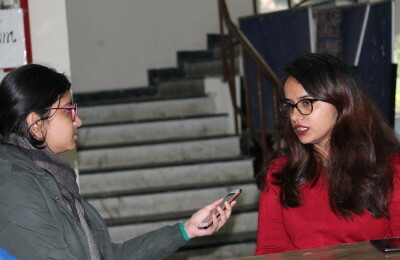 “You ride every metro line with them (the teammates), visit all other campuses, and the bond that you share with your team becomes so strong that you all identify as one,” say members of Natuve, (Hindi for the one who does natya or natak) the dramatics society of Shaheed Bhagat Singh College. And it doesn’t end there, the ex-members still view the society as their own, even if it’s from a distance. “The addiction to theatre captures your soul and the inevitable separation from your little home is hard to digest. Every time you see your juniors perform without you, your heart never stops weeping. It is a place where you grow as a person and indeed it was worth living with my team all these years,” recalls Tanish Chachra, Ex-President of Natuve. Even though the theatre circuit in India saw allegations of sexual misconduct way before #MeToo became popular, but what is interesting to see is that the popular wave of #MeToo, which is seen in pretty much every field today, is non-existent in the dramatics circuit. This could possibly be associated with the sensitisation that the members undergo while presenting a social cause. DramSocs of DU are a world within themselves and the zeal of the members have proven that time and again. “There are good days, there are bad days. But then, after putting in all the effort, when you end up seeing the results, all the bad days seem beautiful,” these are the exquisite lines that Satyamitran, PR of Ibtida leaves us with!